This eBook addresses a few important perspectives on why you should adopt Gamification and create engaging and high impact training. 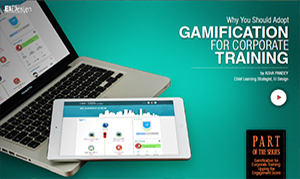 What Is Gamification And How Can It Enhance Corporate Training? This eBook provides insights on the basics of Gamification and how the experience of learning (recall and retention) can be enhanced by using Gamification in corporate training. This eBook provides pointers that you will be able to practically use to craft your strategy to evaluate the right outsourcing partner for eLearning content development. It provides tips on how you can reach a potential partner as well as how you can zero in on the right long-term partner. Is Outsourcing Of eLearning Content Development Right For You? This eBook sheds light on the benefits of outsourcing eLearning content development, the related challenges and how you can ascertain if outsourcing would fetch you the required business gains. 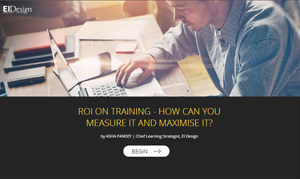 ROI On Training – How Can You Measure It And Maximise It? This eBook addresses the questions you may have with regard to effectively measure and maximise your ROI. It provides a step-by-step approach that you can apply easily in your organisation. 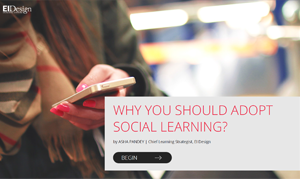 This eBook addresses the questions you may have as L&D professionals on how to integrate a trend like Social Learning meaningfully in your training delivery. 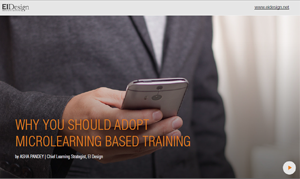 This eBook provides insights on what Microlearning is and how exactly you can use it for both formal and informal training requirements. This eBook acts as a job-aid to Instructional Designers and helps them bridge the gap between theory and application. 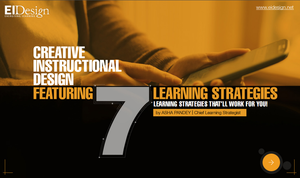 It features 7 learning strategies that have been used in our “InSight” suite of courses on Instructional Design. 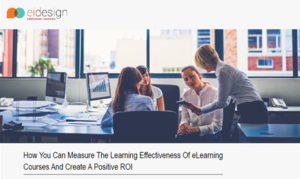 This eBook provides insight on how you can predict, evaluate and validate the Learnability or learning effectiveness of your eLearning courses. Transform Learning with EI Design. Book a Demo today. Copyright © 2019 EI Design Pvt. Ltd. All rights reserved.